This tutorial reviews the process of sending a mass email to a group of users on your website. First you need to log into your website as administrator and then navigate to the Users tab and then Mass Mail Users. Mail to Child User Groups: Enable this options if you wish to mass mail the selected user group and all of it's subgroups. Send in HTML mode: If this option is checked, the email will be sent with html tags. Send to disable users: If you check this option, the disabled users that match the criteria will also receive the email. Recipients as BCC: HIdes recipient list and adds copy to the site email. 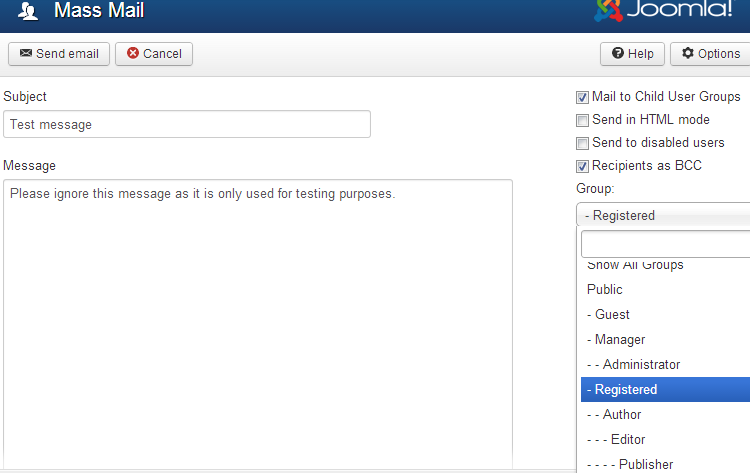 Group: Select the user group that you wish to send a mass email to. Subject: Enter a subject for your mass message. Message: Enter the content of your mass mail to be sent. Click the Send email button at the top to complete the process sending a mass email to your users.